The Stiltz home lifts / home elevators were already popular in Europe before being the first of its kind in over a decade in the USA. Stiltz lifts are designed for those individuals who want to remain home and age in place, are disabled or injured. They provide a tremendous amount of convenience and are a great mobility solution for those who cannot walk up and down stairs. The convenience and cost to install a home elevator instead of moving to a new home can be quite cost-effective. 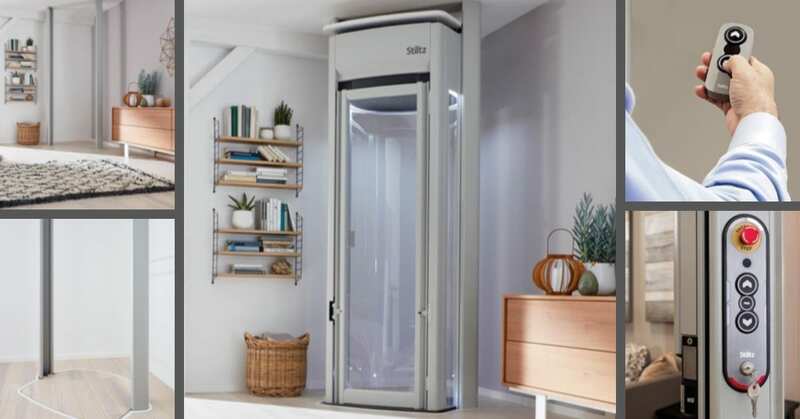 Stiltz home lifts can be installed in just about any location in your home with a simple and easy modification to the existing space, ceiling, and floor. The installation can be completed within approximately two days. There will be a minimal amount of mess and disruption to your home. Stiltz home elevators have a relatively small and ultra-compact footprint as compared to other home lifts/home elevator brands. They cover an area of approximately 12 square feet and can carry up to two people. Because of their size, they can be installed in a tight space such as a closet or corner. Homeowners are unaware that Stiltz home elevators are surprisingly affordable and can be cheaper than their residential elevator competitors. They are quiet as well when operating. There are no noisy vacuum systems or hydraulics. The motor is self-contained. While Stiltz home lifts improve your quality of life, they are a smart addition to your home and a worthwhile investment bringing great value to your property. AIP Mobility Plus is your source to go to for a consultation regarding the installation of a Stiltz home elevator. We are located in Chatham, NJ in Morris County. One of our AIP Mobility Plus Stiltz representatives will be happy to help you. We have been in the business of providing mobility solutions for the elderly to age in place, the disabled and injured to fulfill their quality of life. Contact AIP Mobility Plus to help you get started to keep your independence or gain it back.